Grey and black a color scheme almost as good as black and black. I like it. 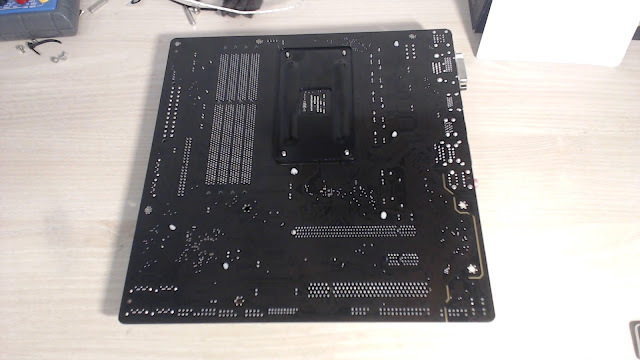 The board has two 4 pin fan headers one for the CPU and one for a chassis fan. 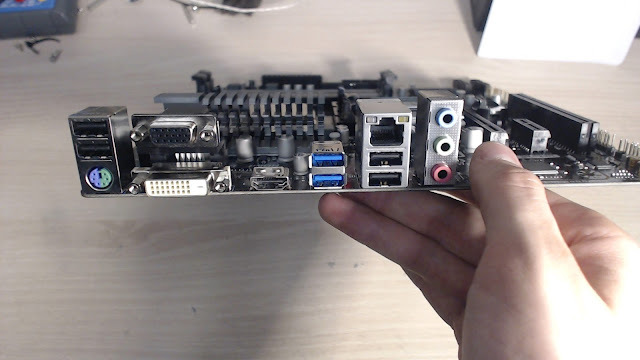 There are six SATA 2.0 ports on the board and 1 IDE connector. Also one internal USB 3.0 port and two USB 2.0 ports. four USB2.0, one VGA, one DVI, one HDMI, and two USB3.0 along with basic audio. 40A at 25C is very very little. So to be safe it's best to assume a de-rating of 50% at 100C meaning that there is a total of 160A available on the low side. Luckily the RT8868 features OCP so this motherboard shuts down before it catches fire if you push it too far. When under load the capacitors and inductors get into the 110C area without a fan over them. The MOSFETs them selves are kept in the 75-85C area by the heatsink. I'd recommend putting some heatsinks on the inductors and capacitors and a fan over the entire VRM in order to extend life span. 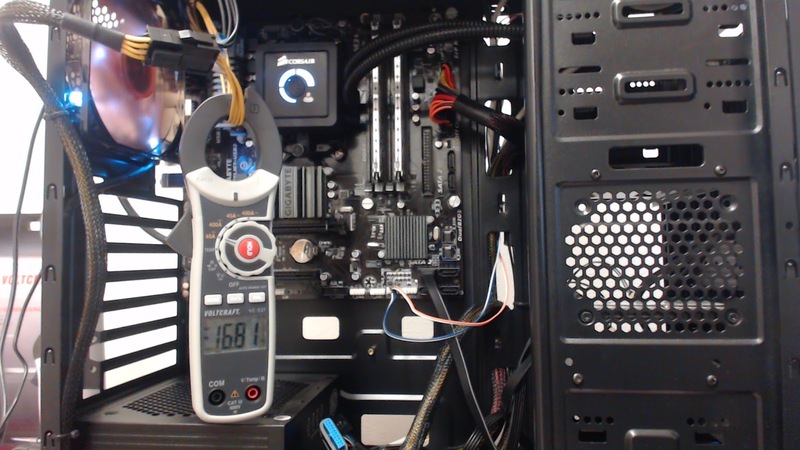 Even a basic 50x50mm fan at 2000RPM would help significantly. This BIOS has many flaws. First of all the CPU voltage setting shows incorrect values until you get the OCP to trip. So when you first boot the board and want to overclock the CPU you will see the option to run 1.7125 Vcore however if you actually set that you only get 1.43V when idling and 1.4V while running regular LLC. Extreme LLC is what it says on the box. It's EXTREME LLC. Giving a ridiculous 75mv Vboost at idle and an even more insane 150mv Vboost under load. I suggest you just don't use Extreme LLC because setting up to not trip the OCP the moment you go under load is really really hard and the low idle voltage will mean stability will always be very very iffy when using it. There are also no OC profiles. The postives of the BIOS are the 1 core per CU mode and the relatively easy navigation and the good responsiveness that some of the overly graphical BIOSs these days lack. That's 214W on the CPU power line. I tried to push more than that but the terrible LLC options and low maximum voltage setting meant that my attempts always pushed well over 240W(was aiming for 220-230W) to the CPU and tripped the OCP. So if you were really brave and patient you cold maybe get a 9000 series FX to run on this board. But you most likely won't and I don't think it's worth the effort. The OCP on the VRM does it's job however it makes rebooting a pain because it doesn't shut the system down it just kills the CPU VRM which leaves the rest of the system still running. When that happens you need to cut AC power from the system because holding the power button doesn't seem to do anything. Between this board and the 970M Pro3 I think the key to choosing the right one is knowing what you want to do. This board is easy to use and very safe. The Pro3 on the other hand offers much more CPU voltage freedom and can definitely push higher clocks but the only safe guard it has is the temperature related throttling. 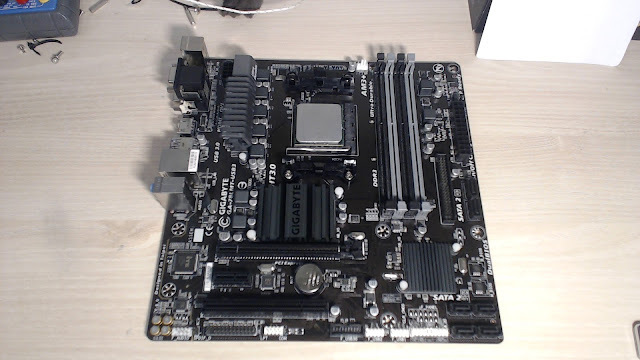 If you just want a basic AM3+ MATX board to get 4.4-4.6Ghz depend on your CPU this board is enough. The VRM has enough cooling to not catch fire and the OCP will stop you before you kill the MOSFETs. You also have an integrated GPU that can save you if you dedicated doesn't want to work. This board also offers better RAM overclocking however that's not really worth talking about with a board that is limited to 1.4375 Vcore. Either way it's a good board and if you want to run an AMD 8 core in an MATX system but don't plan to overclock very much this board has you covered. If you want to support what I do here please hammer the various share buttons down below. If you want to keep up with the various things I do follow me on Facebook. I will also be putting a video review up on the Youtube channel sometime soon. It is less for being informative and more for comedic value because I think there aren't enough motherboard jokes on the internet. As always thank you to CoolerMaster for powering the blog. So do you think its safe to OC an 8320 to 4.0ghz with a decent cpu cooler? Could it get anymore than 4.0? 4-4.4 should be doable if you have a good CPU. Thanks! Will give it a go at somepoint and report back! Man I did not realize that about the LLC and "extreme" overcompensation. 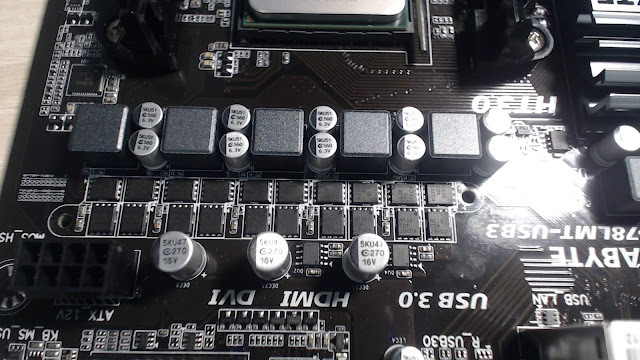 This board is very touchy but just about the only mATX like it with four DIMM slots so I'm okay with the glitches. I noticed that 1.7v showing on first boot, I nearly soiled myself lol. Still rock solid for what it is. I had that too, except it went to 1,55v and therefore was 72c into Windows lol. The mosfets in the review do not correspond to the fact that in fact I personally received with the same revision 6.1, but with different mosfets (with cheaper garbage).